A man is in police custody after allegedly hiding for hours in the woods of Rochester, New Hampshire. Officials in New Hampshire say they arrested a man considered "armed and dangerous" after their overnight search for the suspect near Rochester. 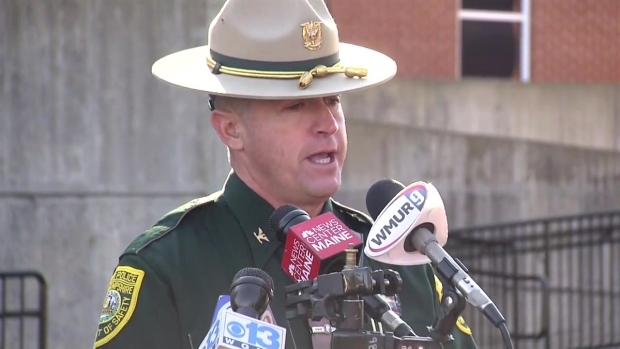 "This event that took place culminated very successfully today without any injuries," State Police Commissioner Christopher Wagner said at a news conference Monday. According to officials, they apprehended the suspect, Christopher L. Thomas, 27, when he tried to leave the woods where he was hiding. They say they saw him leaving his campsite from the air. Officials say they had been investigating Thomas for some time prior to this incident. They believe he has been stealing from Walmart and Market Basket and living in the woods behind the stores. New Hampshire State police Colonel Christopher Wagner details the technology used in the capture of armed suspect Christopher Thomas. He is also wanted for making criminal threats to his previous neighbors in Rochester. The Rochester Police Department created a perimeter around Thomas Monday morning after he fired four shots in the direction of officers. Police say members of the SWAT team approached Thomas around 10:20 a.m. Monday. He surrendered without incident. Businesses in the area are now able to open and Ten Rod Road has been deemed safe for hunters. “We appreciate community members’ patience as we located the suspect and resolved this situation,” Police Chief Paul Toussaint said. 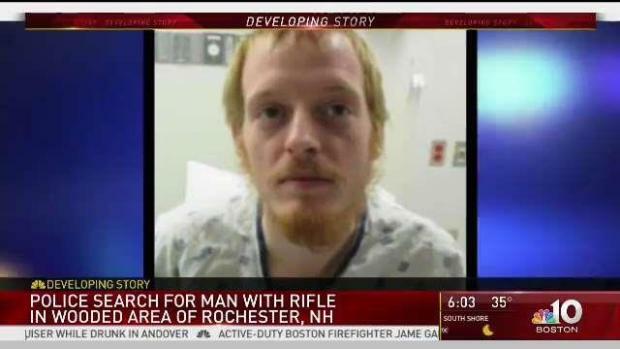 Police in Rochester, New Hampshire are continuing their search for a man seen near a Walmart with a rifle. The perimeter comes after Thomas was seen in a local Walmart parking lot armed with a rifle on Sunday before he ran off into nearby woods. He is wanted by police on three warrants of criminal threatening and four warrants for theft. Nearby businesses were closed Monday while authorities efforted to capture Thomas. Thomas is homeless but is believed to live in the woods behind the Walmart on Farmington Road, according to police. In addition to his original charges, Thomas is facing four more charges of reckless conduct with a deadly weapon for firing at officers. Thomas is being held without bail. He will be arraigned at 12:30 p.m. Tuesday. It is unclear if he has an attorney.